Just Write, Heather: Say Hello to Woody Winfree & Win her book! Say Hello to Woody Winfree & Win her book! As I have been talking about this week, there is a project that I have taken some interest in called, I Am Beautiful. The author/creator of the project, Woody Winfree, has been kind enough to answer a few questions about the project for us. If you leave a comment on this post, on Tuesday, Feb 5, I will randomly draw one commenter to win Woody's new book: We Are More Than Beautiful. You must leave a valid email address to win. What is the I Am Beautiful Project all about? It is about changing the definition of beauty in our culture – one girl at a time, one woman at a time. Quite dramatically, the mass media has chipped away at our sense of beauty and well-being by presenting a singular, narrow and distorted image of female beauty: super-thin bodies, topped by large, perky breasts, with flawless youthful faces surrounded by shiny bouncy hair –and of course, sparkly white, perfectly straight teeth! This suggestion of beauty is not only wrong, it is a LIE. In truth, only three percent of the U.S. female population has the genetic makeup to look like this ideal. That means 97% of us are spending billions of dollars, untold hours of our lives and huge amounts of happiness in an attempt to pursue this distorted ideal. Where did the idea of this project come from? With the creation of my first book for women, I Am Beautiful – A Celebration of Women, the hope was to give our daughters – mine and yours and every other American girl --- a tangible work that they could hold onto. To expose them to images of women that are as real, interesting, diverse and beautiful as real women are. 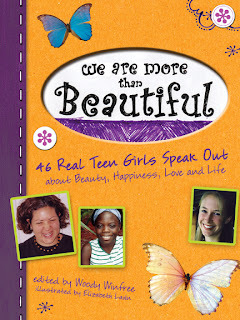 The success of this first book (that is now available in a gift edition), naturally led to creating a book just for girls: We Are More Than Beautiful. Tell me about the new teen book. Who is in it? Where are they from? What stories do they tell – and how is this important to other girls who read the book? The girls in the book are ages 12 to 19, from all walks of American life, facing and exploring all types of issues with self-acceptance and self-esteem. Each girl responded to my query – “Tell me why you are beautiful.” At once, every story is unique to the individual girl’s experience, but universal to the experience of American girls everywhere. Each girl is presented with her picture in an artistically graphic and colorful layout over two pages. This presentation is, not only contemporary and exciting to girls raised in the most visually stimulating culture ever but, affords the reader to enter fully into each girls’ “world” and experience her journey of claiming her beauty. Can the book be used by mothers with their daughters? Why do you believe that naming our beauty is so essential? When we give “voice” to anything, ascribe literal words to a thought or idea, a major shift begins to take place. It might be ever so subtle in the beginning, but in time the act evolves into a concrete declaration of fact. I also believe that we deserve to know and feel our beauty. I believe it is our right, our spiritual right. Can we reach our full potential in this one precious life we have been honored with if we are chasing an artificial ideal of our self-worth? This is the ultimate question that we must ask ourselves – and guide our young daughters looking up to us to do the same. **I just wanted to thank Woody for letting us chat with her about her project and for being so dedicated to the women and girls that we love.